Dosbat: The loss of multi-year sea ice, Part 1. The loss of multi-year sea ice, Part 1. There are two types of sea-ice in the Arctic, first-year (FY) and multi-year (MY). It's been known for some time that MY sea ice is in decline. Here is an NSIDC graphic of the series of James Maslanik. 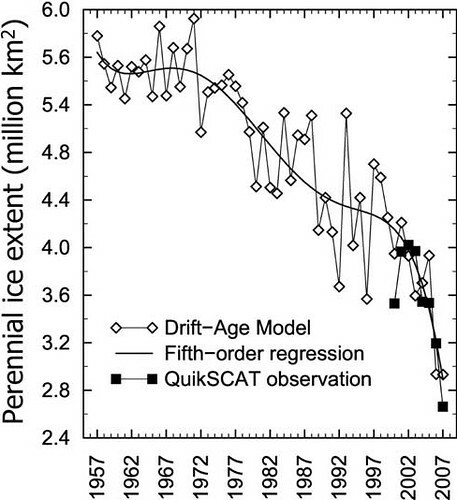 Here is figure 3 of Nghiem et al 2007 "Rapid reduction of Arctic perennial sea ice." Both are startlingly different, yet apparently cover the same thing - the fate of the MY sea ice. So why is there a difference between Nghiem 2007 and James Maslanik's treatments of the loss of perennial sea-ice? And does this difference tell us anything of use? There are various differences between the aproaches of Nghiem and Maslanik, also differences in the areas covered. However in my opinion the major difference is in the treatment of mixed ice. Thanks to James Maslanik for a careful and detailed explanation of the issue - this post reflects my understanding and does not necessarily concur with his opinion. Both studies use the drift age model (DM) of Rigor & Wallace. In the DM the sea ice is 'parcelled up' into regions, these regions move around as observations of the sea-ice movement indicate. If a parcel survives the summer melt season it's age is incremented by a year. So a parcel of first year ice that grew the previous Autumn can become second year ice if it moves into the area that doesn't melt the following melt season. Referring back to the top graph (Maslanik's), there are two maps at the top. From those it can be seen that in the past the bulk of the sea-ice, the region that survived the melt each summer, was MY ice. However in recent years the FY and mixed ice have grown to predominance over the MY ice. The previous picture of pack ice that was mainly MY has gone. For me this is the message of Nghiem 2007, and (no disrespect to Dr Maslanik) I think it is the more physically relevant message. The mass of MY ice that once occupied the Arctic and acted as a stabilising influence on the melt season has rapidly gone. This is important because a mass of thick MY ice is less prone to melt than FY and mixed ice. Firstly MY ice loses it's brine content, which mechanically strengthens it. Secondly because ice insulates, as FY ice grows (by freezing from the ocean onto it's base) it insulates the relatively warm ocean from the winter deep-freeze above the ice, this means FY ice tends to grow little thicker than 2 metres in one season. The limit for this 'thermodynic growth' is about 3 metres over multiple seasons. MY ice that is old can also be thickened by compression and ridging to become 3 metres thick or more. So, being thicker, MY ice takes more energy to melt away leaving exposed sea than FY ice. Aside from the above broad outline of the local properties of MY sea-ice, there is also the regional factor. A regional scale mass of MY sea-ice will be more resistant to melting than small chunks in a 'cement' of FY ice, such as is found in the mixed ice category. Once the FY sea ice has thinned, or even melted away, the MY chunks are exposed to higher temperatures than would be the case if they were still part of the mass of MY sea ice that once composed much of the Arctic ice pack. MY ice, being stronger than FY ice is also more resistant to compression ridging, so wind forcing is less likely to create significant changes in sea-ice area. These factors mean that MY ice is a damper on the seasonal freeze/melt cycle and the variations of weather from year to year. Take the mass of MY ice away and you should expect increased volatility in the sea-ice, such as the sort of event we saw in 2007 - weather having a massive impact upon the sea ice. The term tipping point is rather abused, but if we take ongoing CO2 emissions (and other factors like soot) as a given, then I think Nghiem 2007 and Maslanik's work shows the real tipping point in the Artic: the loss of the stabilising factor of a mass of MY ice amidst the maelstrom of competing strong positive and negative feedbacks due to the physics and physical processes of the sea ice. In the second post I'll discuss what's been happening with FY and MY volume. Maslanik et al 2007 "A younger, thinner Arctic ice cover: Increased potential for rapid, extensive sea-ice loss." GRL. Abstract. Hi Chris R, thanks for letting me know on the ASI blog that you have written these pieces. If you want them to write for the audience over there, I'll be happy to make you guest author. As it is, is it OK if I turn the first part of your posts on Arctic sea ice into a blog post and make a 'continue reading'-link that refers to this page? Yes. Feel free to reproduce, comment and link to here as you need. Well spotted! I've referred to that graph quite a few times since the paper came out. Never noticed that. I guess I was concentrating on the lower figures. Arctic sea-ice free this decade? Maslanik, Arctic sea ice change in Spring 2011. 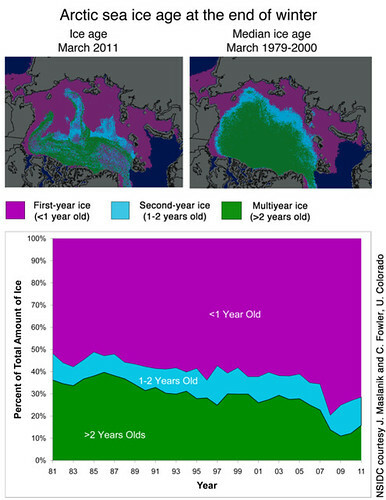 The loss of multi-year sea ice Part 2.